At instantprint, we’re always coming up with new and innovative ways to make the whole online printing process a lot more user-friendly so that your business can flourish with print! One of the ways we’ve done this is by refreshing our proofing journey, meaning it’s now even easier and quicker to proof your artwork to send it off for print. We completely understand that sometimes ‘new’ isn’t easy right away – so we’ve created this complete guide to our new proofing journey for you to refer to if you ever get stuck. The first thing you need to do is to pick what product you’d like to order. 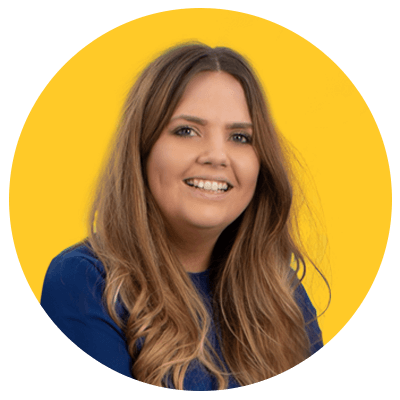 Depending on the product you pick, you’ll be able to choose between a range of paper options, lamination, sides, whether you’d like Spot UV and the quantity you’d like to order before you upload any artwork. 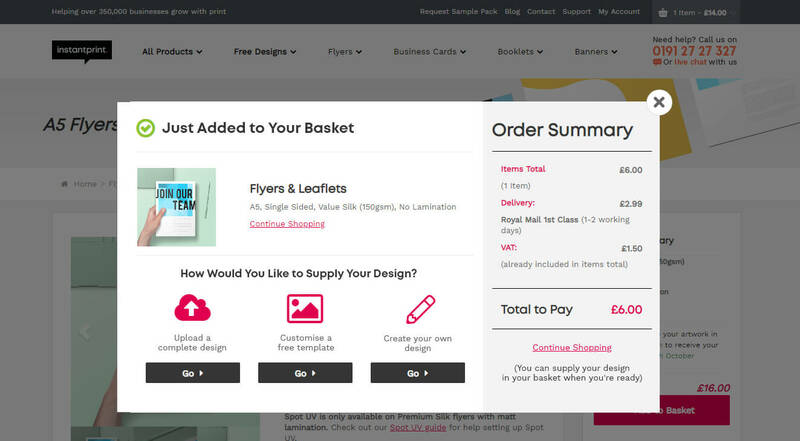 When you’re ready, add your printed product to your basket! We're going to show you the proofing journey for a double sided product, if you have selected a single sided product or a booklet you will skip step 2. STEP 1: How Would You Like to Supply Your Design? If you choose this option, you’ll be able to browse your computer for your chosen artwork file (or if you prefer, you can drag your artwork straight from its folder and drop it onto the pop-up). We accept all of the following file types: AI, DOC, DOCX, EPS, JPEG, PNG, PDF, PSD, TIFF, PUB. If you’re uploading more than one side (e.g. 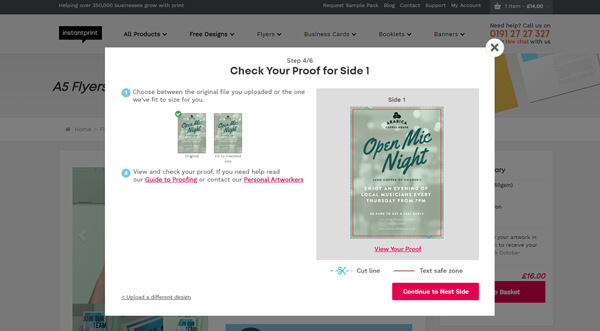 for Business Cards, Folded Leaflets or double-sided Roller Banners), you can either upload both sides in one single file or upload each side separately. When you’re happy, click continue and our website will automatically generate your proof! If you choose this method, check out step 3 in this guide next. If you haven’t got any artwork, this isn’t a problem! 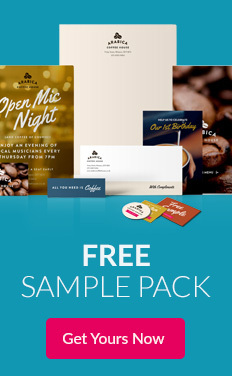 We’ve got thousands of expertly designed free templates you can customise to suit your business. Clicking this option will take you to the ranges of templates available for your product. Pick one you like and personalise it to your heart’s content! When you’re happy with your design, click continue. Our templates are really easy to proof – the next screen shows you your design with a tick box to confirm that you’ve checked and approved the design (and that’s all the proofing you need to do)! This option will also take you through to choose a one of our professionally designed free online templates. However, you also have the option to create your own print ready artwork using our create you own template! Once you’ve picked the one you like, and customised it to suit your business’ needs, it’s really easy to add your logo. Just upload an image by clicking on the ‘Image’ option, then upload it from your computer! We accept JPEG, PNG and GIF files. When you’re happy, you can click continue. This screen is where you can proof your artwork – all you have to do is tick to confirm that you’ve checked and approved your design against the bullet-pointed criteria we’ve suggested and continue to checkout! The rest of this guide will follow the steps after you have picked 'upload a complete design'. Don't worry if you have selected to create your own or chosen a template as we will do all the hard work for you, all you need to do is approve your design on the preview design page. STEP 2: Are Both Sides of the Design in the Same File? Here you will need to select whether the front and back of your design is in the same file (e.g. 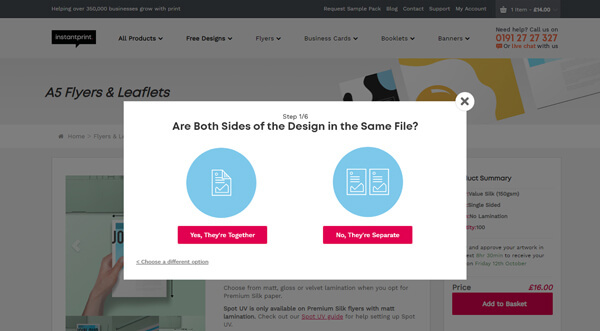 a PDF) or separate files (e.g. 2 JPeg images). This is an important step as the next window will either ask you to upload one file or two sides. At this stage, your file is being uploaded to our proofing system. Here we check your colours are in CMYK, the resolution of your design and if your artwork has bleed. Don't worry if your artwork is not setup in CMYK, we will convert the colours for you. Creating proofs can take a while depending on your file size, if you are waiting at this stage for longer than 30 minutes, contact our customer service team who will be able to advise you on how to get your artwork proofed. What is Continue Without Approving? 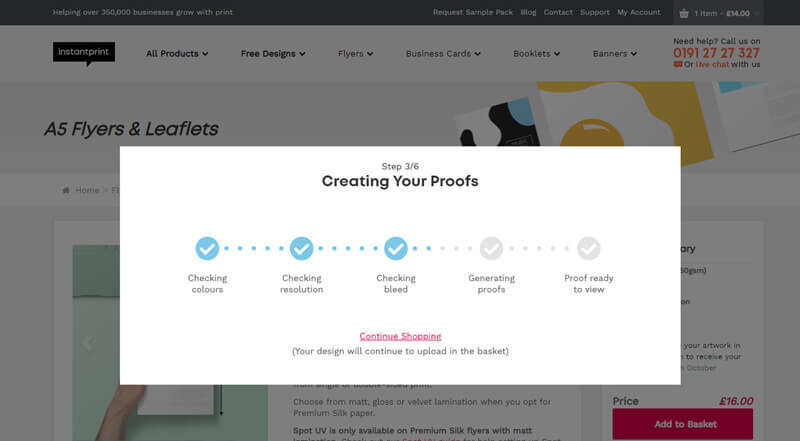 If you are unsure about your proofs you can click continue without approving to add your product to the basket. If you place the order without uploading artwork you will receive email submission details in the order confirmation email. Please note, if you would prefer to email your artwork across, please allow an extra working day for delivery. For artwork emailed in, we will endeavour to return a proof to you within 24 hours which must be approved before the job can go to print. Here you’ll be asked to download your proof. Once you’ve checked them over and made sure they’re exactly as you want them to be, continue to summary to confirm that you’re happy with the proofs. If you need any extra help with checking your proof, check out our proof checking guide. You’ll then be asked to tick to confirm that you’ve downloaded and checked your artwork – and all that’s left is to click ‘Approve for Print’. Now that your artwork is approved in your basket, you can proceed to checkout! What Do the Autocorrect Options Do? Original – this keeps your artwork the same and places it directly onto the product of your choice. If your artwork doesn’t fit the size of the product you’ve chosen, you’ll be able to see a white border around it. Fit to Finished Size – fits artwork to the trim and automatically adds 3mm bleed. This means that when we print and cut your artwork, there’ll be no white border. If you choose to continue shopping after you’ve added something to your basket without uploading artwork, you can still add your design to your order at in the basket. Once in your basket, choose to either upload and proof your artwork or create design online using one of our free templates. To proof your uploaded artwork, click ‘Proof ready to view’ in the basket and then follow step 4 of this guide. If you are unsure about your proofs or you are unable to upload your design file, you can contact PA pa@instantprint.co.uk for advice on setting up your artwork before you place your order. Or you can place the order without uploading artwork and submit your artwork to artwork@instantprint.co.uk. Checking over a manual proof can be tricky – but don’t worry – we’re here to help. Here are some of our most frequently asked questions and answers. Looks great! How do I approve and when will I receive this? You will need to reply to the proof email to let us know you approve it. If you have more than one job on the order you will need to approve all of the proofs before your order will go to print. 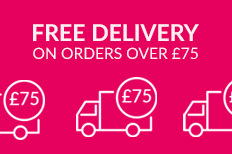 Once you’ve approved all of your proofs, we’ll dispatch your order in one working day, which will then be delivered the following working day. There’s a mistake – how do I send new artwork? You can send new artwork in reply to the proof email. If it’s a large file and can’t be sent via email, we recommend using www.wetransfer.com. Remember to quote your 7-digit proof number so we can link the updated artwork to your order. Why are the colours so bright? The colours may appear bright or vivid if you open the PDF in a web browser or on a mobile phone or tablet. This is because they do not use correct PDF viewing settings. Check the PDF on a PC or laptop and open the file with Adobe Acrobat or Reader to view correctly. Why can I see the bleed, crop marks or a mirrored effect? If you open your PDF proof with certain programs, you might see the bleed area marked out by a dotted line. This line is used to make sure there are no white edges on the final product once it’s been printed and cut. To view a proof without bleed, you will need to open the PDF on a PC or laptop using Adobe Reader or Acrobat. If you open the PDF in Adobe Creative Suite or in a web browser, the proof will show the bleed area. Why is there something missing from the proof? Text and images may not show in the proof because of flattening issues. Please reply to the proof email to make our Proofing team aware of the issue. Why are there thin white lines around text and images? This might be a viewing issue. If the lines disappear when you zoom in and out of the proof, they will not be on the final print. If they’re still visible, email our Proofing team and they’ll be happy to check this for you. Why do the ‘l’s and ‘i’s look bold? This is a common PDF viewing issue. If you zoom in to 400%, you’ll be able to view to text correctly. Why are the colours darker? The colours on your proof may be slightly darker than the original artwork you supplied. This usually happens when the original artwork is in RBG and has been converted to CMYK for print. A computer screen shows more colours than can be printed, therefore we may have to alter the colours slightly to show how your product will look once it’s printed. To alter the colours yourself, you’ll need to change the colour mode on your design software program to CMYK and adjust the colours slightly. You can find more information in our colour guide. Why is there a white/black border? If we’ve added a border to your artwork, this means that some important elements of your design could be too close to the trim line and are at risk of being cut off when printed. If you don’t want a border on your proof, reply to the email with a new piece of artwork, making sure all text is 3mm from the trim line and that you’ve add a 3mm bleed area. You can find more information in our bleed guide. Why has my font changed? When we receive artwork, any fonts that aren’t embedded are automatically converted to a different font, which is what you’ll see in your proof. To avoid this, you’ll need to outline or embed the fonts you’ve used in your design. A simple way to do this is to save the artwork as a high-resolution JPEG. You can find more info in our fonts guide. Why has the layout changed? If your original artwork was supplied as a Microsoft Word or Publisher file, it will have been converted to a PDF for print by an automated system. This can sometimes change the layout and we’re not able to fix this. To stop any layout changes from happening, we recommend saving your file as a PDF or JPEG. Why is my proof blurry/pixelated? If this happens, your artwork may be saved at a low resolution or some elements of your design could be low resolution. We recommend saving any artwork at 300dpi (dots per inch) for a high-quality print. All elements such as images or logos also need to be 300dpi or higher. Images and logos may be pixelated if they are downloaded from the internet. If this is the case, you’ll need to replace the images with higher resolution ones for print. You can find more information in our resolution guide. This is the wrong product/stock/quantity – how do I change this? Can I save the artwork for future orders? We do keep the artwork and orders on file, however we recommend keeping a copy of your artwork if you would like to order it again. Unfortunately, we are unable to save the artwork on your online account for you.